Life on the ocean floor mainly changes with the depth. The shelf areas adjacent to the coasts down to a depth of 200 m are especially rich in nutrients. They are followed by the continental slope to a depth of 2000 or 3000 m. The Abyssal reaches as deep as 6000 m, and even deeper is the Hadal. The North Sea has an average depth of 92 m, it is a shelf sea mainly situated on the European continental shelf. The Baltic Sea instead is an interior sea with bracken water and a depth of down to 459 m, which receives salt water only through the Belt from the North Sea, but fresh water from the many tributary rivers opening into it. Finally the Mediterranean reaches much different dimensions of depths – the deepest place in the Mediterranean is the Calypso Deep southwest of the Peloponnesus, at 5267 m.
Sea grass bed in the Baltic Sea. Picture: Norway Team. The shelf areas are very rich in nutrients and as a consequence, also of very high economic importance. Where vegetation provides a rich supply of food, the fauna also will be very rich in species. In depths of 15 to 40 m in rocky shelf areas off the American coasts kelp forests grow with a very large richness in species and distinct influence on the global climate. Kelp, a mixture of red and brown algae, is very rich in nutrients, so it is even of economic importance to man. This again has had severe consequences for the kelp forests, which have to be considered as threatened world wide, not only because of water pollution. On sandy grounds in a depth of down to 40 m, meadows from sea grass (e.g. 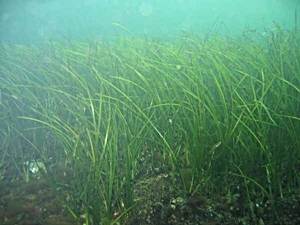 the common sea grass, Zostera marina), develop, whose ecological importance for the variety of species living there is similar to that of kelp forests and so is their impact on the global climate: one squre metre of sea grass bed produces up to 15 litres of oxygen per day. 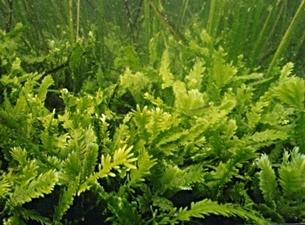 A threat to sea grass bed not only is water pollution, but also illnesses and the displacement by introduced neophytes, such as the green algae species Caulerpa taxifolia, because of its numerous appearance also called the algae pest. Some sea snail groups are described more elaborately on separate pages. Triton's horns are well known for their use as a musical instrument since antiquity. Triton was a sea god of ancient Greece. Tritons or Triton's horns are also marine gastropods of a very large size. 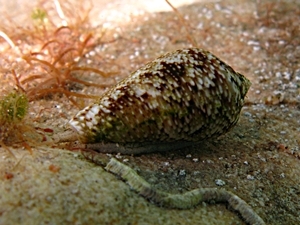 Charonia lampas, a species found in the eastern Mediterranean, reaches a size of 30 cm, while tropical species may grow to half a metre shell length. Tritons are predators, which mainly feed on echinoderms (Echinodermata), especially starfish. When a triton attacks a starfish, it grasps it with the foot (larger starfish sometimes can escape by loosing an arm). Then it begins to rasp through the hard outer tissue with its radula. As soon as there is an opening, the triton uses saliva from its large glands to paralyse the starfish and then feeds on it. Especially in coral reefs tritons have the important task of regulating the starfish, which otherwise would harm the reef by feeding on corals and inflicting severe damage. Cone shells are quite well known from the tropical and subtropical waters around Australia and of the Indopacific. They are predatory snails, hunting their prey with the help of a hollow tooth injecting venom into the prey's organism and paralysing it. While larger species, such as the textile cone (Conus textile) hunt fish, the smaller species live on other molluscs and marine worms. Picture: Hector Giourgis, Eastern Mediterranean Inhabitants. It might be less well known that there are cone shells as well in the Mediterranean. Compared to the tropical species, the Mediterranean cone (Conus mediterraneus) is tiny, about 2 cm long. Like its larger relatives, it does have a venom tooth, with the help of which it hunts for marine worms hidden in water plants of the shallow water and tidal zone. 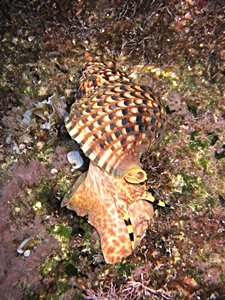 Purple snail (Hexaplex trunculus) attacking a Venus cockle. Muricid snails are a further gastropod family, of which the spectacularly formed shells of tropical species are quite well known, such as the Venus comb (Murex pecten), whose spines are supposed to protect the bearer against attackers. 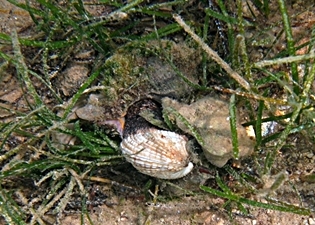 Muricid snails, however, are also existent in the Mediterranean, also in the North and Baltic Sea. Better known the Mediterranean muricids are as purple shells, such as the Hercules club (Haustellum brandaris) or the purple shell (Hexaplex trunculus). Muricid snails are predators. They feed on other molluscs, tunicates, worms and crustaceans. Among them also is the sting winkle or "oyster drill" (Ocenebra erinacea), a snail up to a size of 6 cm, living in the Atlantic, the North Sea and the Mediterranean. Also somewhat soberly referred to as European sting winkle, the oyster drill mainly feeds on oysters and other bivalves, through whose shells it drills using the radula and then eats them. 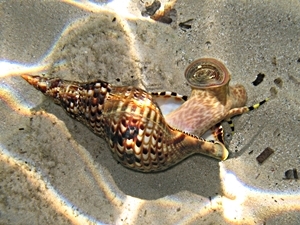 The foot is used to hold the shell to prevent it from moving away. Wikipedia: European sting winkle (Ocenebra erinacea). In Italy, muricid snails are called "cornetti di mare", but people like to eat them not only there, but also for example in a portion of Spanish paella.